If I was to say the one thing I am most excited about my tournament results it was my takedowns. It felt like the first tournament that things really started to click. I have been working a lot on not hesitating when I get into a good grip that I like to throw off of. Even as recent as my tournament in Florida I felt that I had a couple take down / wrestling opportunities that I didn't take advantage of when I got into certain clinch positions. Well, this time I made it happen out there and am really excited when I get back to Calgary tomorrow to tell my wrestling coach how it went. Ron (wrestling coach) has been so important to the progression of my takedowns this past year and helping me work on my technique, speed and style. Thanks so much to Ron, I feel so happy with what I have accomplished because of him. 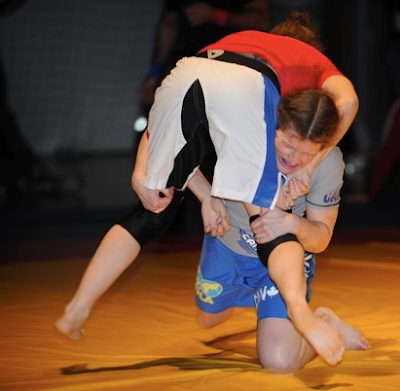 One of my particular matches was against a girl who is very good at not getting taken down but she is good at getting into strong sweeps and submissions from stand up to avoid having someone score a takedown on her. I came in with a solid game plan for her and got the double leg take down and in another fight a single leg chest pressure.